← Love is…a crate of tomatoes. I adore pasta. I adore it in all its shapes and sizes. I am fairly sure that I am anatomically composed, at least predominantly, of the stuff. It is comfort food in its purest form. It can be eaten at any time of day, and with as little as a squeeze of lemon, a slug of decent olive oil and a bit of cracked black pepper, becomes an entire meal. I have to stop eating so much pasta. The ultimate fast food, it is the first thing I reach for when I don’t know, or can’t think, what to feed my family. There is invariably a bag of bog standard shells, or even fairly elegant pappardelle, linguini or orecchietti in the cupboard that, when paired with whatever I can lay my hands on in the fridge and larder, becomes a meal that will leave the whole family satisfied. And then there is the really good pasta. The fresh, handmade (or better still homemade) variety, possess tenderness and flavour that you often can’t get in the dried varieties that you buy in bulk in the supermarket. I am not a snob. De Cecco and Barilla are really not terrible (Barilla in fact make the best wholemeal spaghetti – almost edible), and Cipriani makes some pretty good varieties. In fact, Heston believes that La Pasta di Aldo or Rustichella d’Abruzzo’s Linguini (readily available in lots of local Delicatessens) is the very best pasta to use when making Spag Bol. I do not argue with Heston. There is something enthralling about the immediacy of freshly made pasta though, that I find hard to ignore when confronted with its’ presence on a menu. I ate the most divine Burrata Ravioli at Osvaldo’s (our current favourite Italian in Singapore) the other night, and decided that pasta just didn’t get much better in my book. Swimming in a pale pink, buttery, fresh tomato sauce with shards of dried red chilli, were the most utterly delicate pouches filled with melting Burrata cheese. 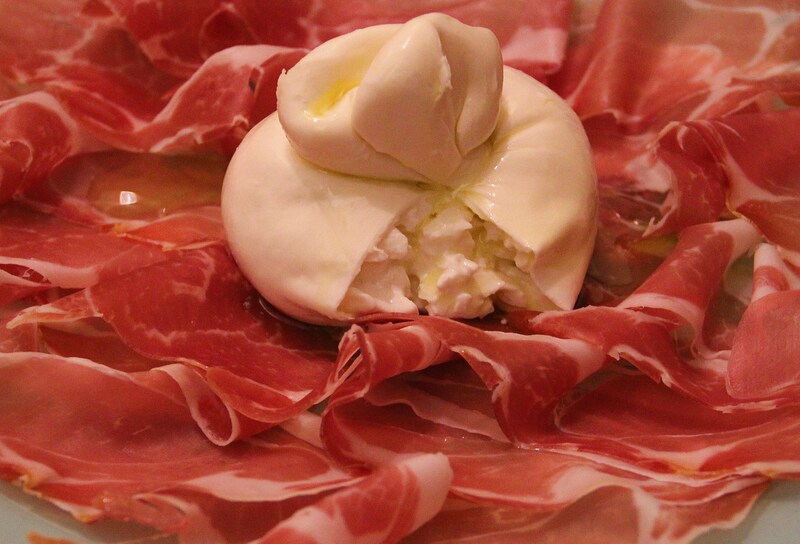 A baby burrata...in all its' prosciutto backdropped glory! I love Osvaldo’s pizzas. But this time, it was his pasta that made me fall in love with him…well, with his cooking… all over again. I wasn’t sure about the idea of cooking my favourite cheese, but it worked. Though it had lost the creamy, stringy texture that it is famous for, it had taken on a mousseline quality and dissolved almost immediately in my mouth. I was converted. Though a purist at heart (I will never say that it was better than the fresh version served with nothing more than a spoon), I have to admit, it was pretty damn good. But as I said…I have to stop eating pasta. One of my favourite types of pasta (technically not a pasta at all by the way) is gnocchi. I remember my grandmother making it. I watched her from my perch on the kitchen counter as she stood in front of her terribly English, mustard yellow Aga, and rolled tiny dumplings on the back of an old silver fork. It occurred to me, even at that tender age, that my grandmother was doing something different. Something that not your average grandmother (in the depths of deepest darkest Somerset at least) did on a regular basis. She was utterly unafraid of new ingredients and recipes, and even when things didn’t quite work the way they were meant to, she simply announced their arrival at the table with a name manipulated to adequately describe the end result without apology. Her gnocchi was no exception…that night we were served with “watery dumplings with no taste, with, thank goodness, a very nice tomato sauce”! I don’t really remember the dumplings themselves, but I do remember that she always made a very nice tomato sauce (a tradition my mother continues). But it is one of those fond, fleeting, foodie moments that are recalled every time I eat gnocchi…wherever I am in the world. I can’t help but feel a glow in the very centre of me. Not unlike the warmth from a mustard yellow Aga. I have subsequently eaten gnocchi in many guises; potato based dumplings simmered in a stock, a German version made from flour and egg put through a potato ricer and sliced off in little strands as they hit boiling salted water, a delicious Polish herbed version that is pan fried and not unlike a dish the Swiss are famous for, covered in melting Raclette cheese. I do like a dumpling. You can serve these with a light hollandaise, a creamy fresh tomato sauce, pea puree or on their own as a drinks party canapé. I served it as a starter with a warm pea, baby shelled broad bean and pearl onion salad as shown above (some ragged pieces of prosciutto would have been a welcome addition too for meat eaters). Not bad…especially with a squeeze of lemon and a glass of ice cold dry white wine in the sunshine. Mix all the ingredients except the last two together until well combined. Check the seasoning and whether it is ‘lemony’ enough, and add more salt and pepper and/or lemon juice if desired. Now mix in your beaten egg until completely combined and then slowly add your breadcrumbs, tablespoon by tablespoon. You don’t want a very stiff mix, but just solid enough to be able to form soft dumplings. The softer they are, the more delicate the end result will be, but also remember that if they are too soft, you will not be able to form quenelles (three sided dumplings), and they will spread when you cook them. Leave the mixture in the fridge for fifteen minutes to firm up a little. When they are cold they are also easier to form shapes with and tend to hold together better as you cook. Take two identical teaspoons, and gently form quenelles by sliding the mixture from one spoon to another, using the spoons to create three smooth sides. They don’t have to be perfect and if you find it too difficult you can simply make little balls and give them a squash to make more rustic style patties. Cook them in a non-stick frying pan in about ½ cm of oil. I use half vegetable oil and half olive oil. Put the oven on at about 130C, and get a paper towel covered oven tray ready to receive the fried dumplings. Have the heat on low, and when oil is piping hot, place the dumplings in the pan carefully in small batches. Cook each side for about 30 seconds, or until nice and golden. Drain on paper towel and place in the oven to keep warm while you make the next batch. 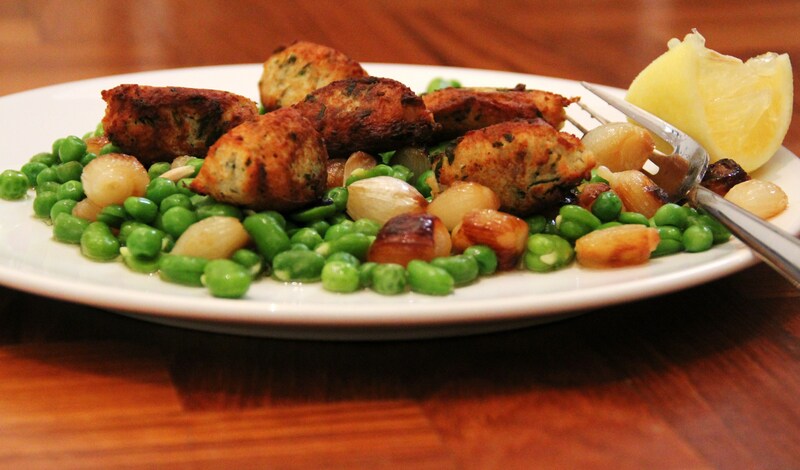 Serve three or four dumplings as a starter, more as a main with salad or petit pois (as above), or have them as a pre-dinner snack. Either way they didn’t last long in our house and were a big hit with our small person. The salad underneath was simply defrosted baby peas and broad beans (shelled) blanched for a few seconds, mixed with pan fried pearl onions and tossed together with salt, pepper, good olive oil and a couple of pinches of lemon zest. Seriously…that simple. my kind of blog. thanks. Hey Laura, lovely to find this blog, but really Spag Bol? When is the last time you were in Italy, real Italian cooking almost never mixes meat and pasta together. The meat or freshly grilled/baked fish is a secondo. As for gnocchi, now now now… it potato based, it not a pasta at all, but it’s jolly yummy all the same. In truth I think drastic action is required… as soon as number 2 pops out, it time for a gourmet trip to Italy, to, you know, re-acquaint yourself, just a little bit with real Italian cooking. Naturally we want to put you and family up. And equally I expect to be taken to visit Osvaldo’s when we come over to you. 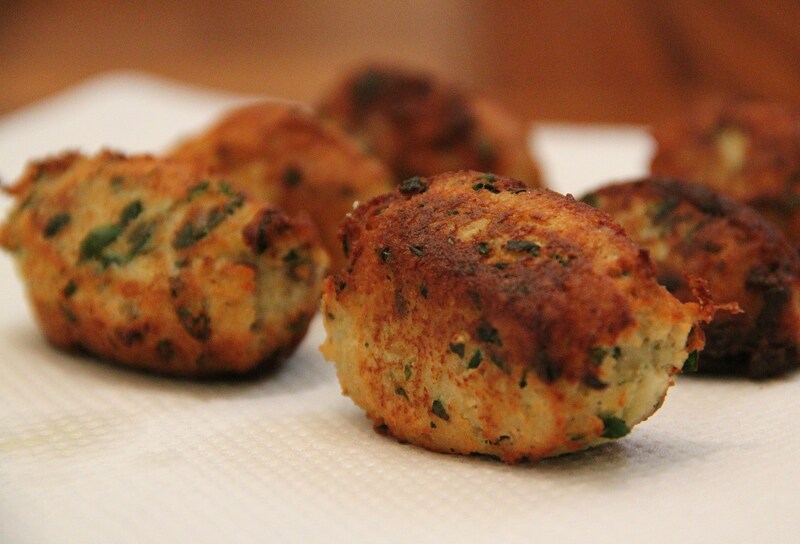 You are absolutely right…these are definitely not gnocchi… hence the reason I called them DUMPLINGS! However, I would love a decent gnocchi recipe if you can lay your hands on one. As far as I am concerned, no Italian food is really Italian unless eaten in Italy; and Spag Bol is certainly an utter abomination entirely dreamed up in England – though it is also part of our comfort food heritage.